Thanks For The Memories, Charley!! …How inadequate we felt the day before the hurricane hit. …What do New Jerseyeans know about preparing for a major tropical hurricane? ..
…Floridians told us not to worry, we’ll be “fine.” We were alive, Thank God, but we were not fine! …That storm preparation is such hard work and continues until the last minute. …If you’re going evacuate, you need to make that decision BEFORE the last minute. …My annoyance that all this “preparation” was messing up my brand new beautiful house. …How my priorities have changed since then. …Your “treasures” just become stuff you have to move. …The shock when Charley picked up speed with winds of 145 mph, becoming a category 4 hurricane and heading right for us. …Thinking we should have gotten hurricane shutters. …Feeling scared when the power went out. …Hailing the newscasters who kept us informed day by day on our little transistor radio. …Praying the roof would not fall in on us. …Feeling God’s ASSURANCE of protection from the storm. …Experiencing how hot it is when you’re under a mattress with no air-conditioning. …It’s true…it SOUNDS LIKE A FREIGHT TRAIN. …Praying for the safety of our family, friends, and neighbors. …Hearing our house being pelted by projectiles. …Feeling our house shaking and hearing our garage door rumbling. …Crying when my husband sees our lanai screen rip off our house. 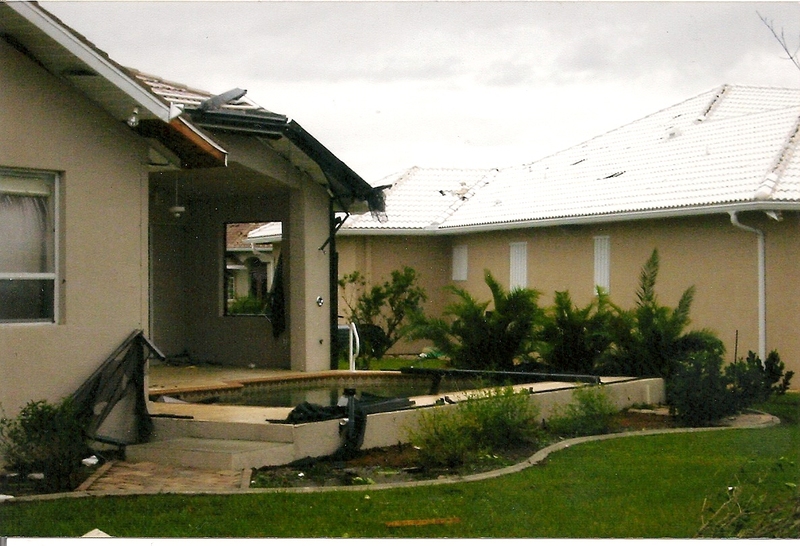 …The sound of glass breaking, knowing the storm was in our house and our stuff was getting wet and damaged. …When we ventured out, a police officer told us to go inside, there could be tornadoes. …Hearing on the radio that one tornado may have touched down near-by. Right where our church is. …The shocking, heart-wrenching sight outside our house the next day. …Finding it hard to believe, but many others were far worse off than we were. …FEELING THANKFUL TO BE ALIVE!! …Grateful to God for the safety of family, friends, and neighbors. …The joy of helpful neighbors with a grill. …I thought we’d just go on as usual the next day, but seeing that it looks like a bomb hit here. …Seeing the destruction everywhere, like a war zone. …Wondering where to start cleaning up this mess and rebuilding. …Learning that “replacement of landscaping” is not covered in our insurance policies. …All mature trees in the neighbor fell, thankful that we didn’t have any. …Palms trees were bent, but not broken. …Believing God’s gift to Florida is air conditioning and missing it!. …The days and days of debris pick-up were exhausting, it’s so hot, and no relief in sight. …I had no idea we could be so needy, and I’m so thankful for those from everywhere who met our needs so fast. …Piles of dirty, stinky laundry are just in the way, when you have no way to wash them. …Frustrated to have no way to communicate with loved ones, we felt cut off from the world. …Frantic family and friends who couldn’t reach us by phone, while watching the photos of the devastation on TV, and sending us money. …Food spoils in the refrigerator and freezer with no power to keep it cold…there must be a better time to clean them out than after a hurricane. …Realize that food doesn’t mean as much as a refreshing shower, even one just a little trickle of water. …Letting friends use our shower, in exchange for a trip to a working laundromat for clean clothes. …It’s 95 degrees, all the windows in the house are open, and the neighbor’s generator is so loud, but it’s too hot to get a good night’s sleep anyway. …Finally found some battery operated fans, Amen!! …Noticing that pickuping up debris in the hot sun, day after day, gave me the best tan I’ve ever had, but lots of bug bites, too. …Driving is dangerous when six-lane highways have no traffic lights. …It’s hard to find anyone when there are no street signs. …Seeing blue tarps on every roof, and huge mounds of debris everywhere is very depressing. …Our pool looks like a septic tank filled with all our lanai screen debris in it. …Garbage will smell after it’s been outside along the roadside for days when there’s no garbage pick-up. …You’ll want to kiss the feet of the garbage man, and the guys who pick up all the aluminum from the lanai screens, when they finally come. …You’ll rejoice when Publix opens, even when you need to bring your flashlight. …Ice is a precious commodity. …But, ice in a cooler is a messy replacement for your refrigerator/freezer. …I really appreciate a clean house, and I can’t remember anymore when I had one. …The threat of mold can make you crazy. …Interesting to know what’s in a Red Cross “disaster kit,” and so appreciative. …The concern and love from family and friends, Thank God they know how to pray. …Sensing after seven days of this, it was time to get out of town. …My sister was an angel who carne to our rescue with the offer of her condo. …Found a church to get spiritually refueled. …We returned home when power was restored, because my husband was too exhausted to cook dinner and was eating SPAM. …Fooled into thinking the hurricane season was over. …Bolting everything down again, and again, and again. …Moving furniture back and forth, inside and outside many times is frustrating and exhausting. …Strong winds blowing. Chance of flooding. Tarps flying. Cabin fever. …Worried the debris that’s still in huge piles by the curb, will blow around and create more damage. …Shell-shocked. Got to get out of here. Another hurricane is coming. …Thank God for another angel who let us visit in California to hide from this next storm. …Still finding roof tiles in my landscaping two months after all the storms. …Will we be decorating the debris this Christmas? Putting tinsel on the trash? …I know I won’t be thinking about costly gifts this Christmas, but only of the gift of God’s love and protection for us! Amen!